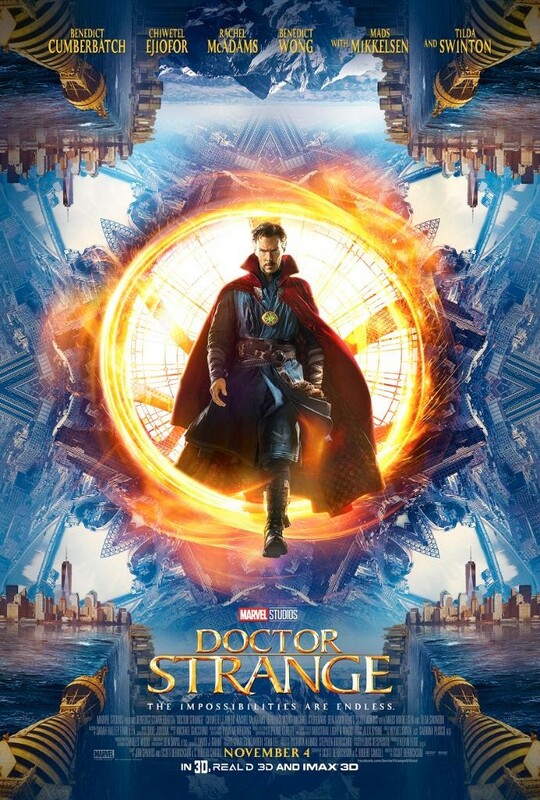 In the latest line of Marvel comic book hero movies comes Doctor Strange. There was a lot of trepidation on this one as it starred a superhero not everyone was very familiar and the first few teasers and trailers didn’t do the best job at selling it. Would it be fun and entertaining like the rest? Added to the difficulties was the whole element of magic that is absolutely necessary to tell this story. Yet Marvel did not disappoint. Not only does Doctor Strange deliver a fun, entertaining movie, but is also feels like the other Marvel comic book hero movies, thus cementing itself into the universe that it will be melding with. At the center of the film is Benedict Cumberbatch who plays Dr. Strange. In order to stand apart, Strange is very different from the other super heroes we’ve come across. He takes arrogance and ego to a new level. Heck, he can be downright mean and unlikeable. His transformation in the film, going from an egotistical neurosurgeon to a slightly humbled hero who finally accepts the responsibility to try and help others rather than just himself, is a rather long one. Even by the end of the movie, there’s still that arrogant side of him clinging to selfishness. In that regard, it’s realistic as people don’t miraculously change into better human beings. We can get better, but everything takes time. On the other hand, those qualities also make him a little unique from the other heroes we’ve seen. Cumberbatch’s Doctor Strange has a very different feel and it works. Unlike many of the Marvel films we’ve seen lately, this one tones down the cast and does not introduce a bunch of familiar supporting heroes or cameos. There’s no Captain America, no Iron Man. There is one cameo in the end credit scenes, but that’s it. The rest of the cast is comprised of new characters, whether fellow heroes or villains. And the supporting cast generates some very interesting characters. Mads Mikkelsen does a great job as the villain and plays a character with motivations that led him down this dark path. Tilda Swinton plays the Ancient One who teaches Strange how to do magic, yet there are complications to her character that play a very important part in the plot. Chiwetel Ejiofor plays a fellow sorcerer named Mordo who has his own story that proves compelling. Even Benedict Wong steals the screen for his scenes as they all lend to some great humor. All around the casting was spot on and the acting was excellent. The characters they crafted with the story were all interesting and helped the movie stand out rather than feeling like just another Marvel superhero movie. I think the thing that surprised me most was the humor. They put a lot of laughs in the movie, many which are being spoiled by the tv spots. Luckily I went into the movie without having any of the jokes spoiled except for the wifi password one. As such, the movie was a lot of fun. One of the highlights is Doctor Strange’s cape which certain came to life as a character of its own, another factor that helps the movie and the hero stand apart. However, sometimes I almost felt that maybe they were pushing the humor too much. It’s hard to gauge that with only one viewing, and even so, I enjoyed the movie. It wasn’t to the point that the humor became a flaw, but there were enough jokes in the movie that I suddenly got pulled out of the story and became aware of it. It’s a difficult line to find a balance on, but it is something Marvel should be careful about. There’s always the desire to make themselves the opposite of DC and the dire/serious tone of their films, but you can go too far in getting away from that. Natural humor works a lot better than forced humor, and I think Doctor Strange may have been forcing it a bit much. Overall, I really enjoyed Doctor Strange and I’d certainly go see a sequel. The characters were interesting and entertaining, the plot was fun and packed with Inception like action and magic, and there was a lot of humor which kep the movie light hearted, even when darker tones interjected themselves. I give it a five out of five metal bikinis.